Experience the excitement of a movie, in just 90 minutes. Everyone knows that 80's movies are the best action movies ever! Adventure, explosions, cars, power-ballads, excitement, justice, ninjas, bad science, guns, flags and outrageous fun: all finished within an hour and a half. Well, now you can make one with just a couple of friends and some six-sided dice! 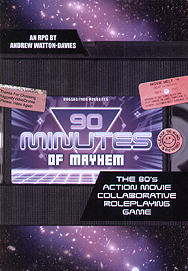 90 Minutes of Mayhem uses an intuitive, rules-lite game engine to ensure that your roleplaying group can collaboratively tell the story of an entire movie story within an hour and a half, whilst still having the full experience of the greatest decade for action and adventure! A simple Five Step Character Creation System! One simple Game Mechanic to Resolve Everything! A Full Guide to Directing your 80's Action Movie!